This listing is for a 5 inch heavy resin, multi-colored SAnta Muerte statue with my Original Santa Muerte oil. Santa Muerte is a sacred figure in Mexico, believed to be a mix of mesoamerican and catholic beliefs. Her name literally translates to "Holy Death" or "Saint Death." Mexican culture since the pre-Columbian era has maintained a certain reverence towards death, which can be seen in the widespread Mexican celebration of the Dia de los Muertos-Day of the Dead. Her devotees are faithful and unlike any other sect I have met. 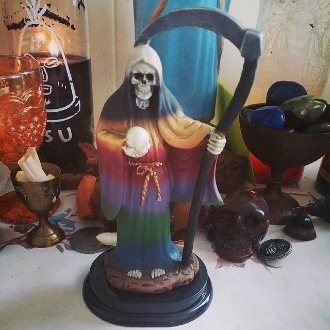 Santa Muerte can grant miracles, solve impossible problems, keep husband's faithful ,and bring you luck and good fortune.She is also an AMAZING healer. I attribute her to healing me of some cancerous cells I had before I needed surgery. She reminds us of our mortality and morals, to make wise decisions so we will not suffer in this life. She reminds me that life is fleeting, make the most of it, and help make others lives better while you can. If you are not giving, then you are taking. Santa Muerte may remind you of this if you are "using" her for favors rather than truly following her, by taking things away from you in your life. She may also ignore your requests if she sees that they lead to misfortune in the future. She is to respected and worshiped before she is asked for any help. I ask for your permission to invoke the Holy Death. in my home, and on my path. and I ask that you please grant me________________. blessed and praised by your charity Holy Death. because I see your charity through your tests, which are perfecting my spirit. I will have you Holy Blessing. My oil is created with her favorite scents, rich oils of ylang ylang, blood orange, rose, and lavender.